Update: MBA Key Metrics Spreadsheet Project Version 2 Released! **New** Automatically Generated Charts I’ve created several new automatically generated charts that also now display both the 2015 and 2014 results. The Recommended Actions list is automatically generated into a simple, one-column, easy-to-read list. You can measure your employees’ attendance, patient capture rates, website traffic, profitability, social media insights, and more. There are hundreds of data points that you can measure in your office every minute of every day. 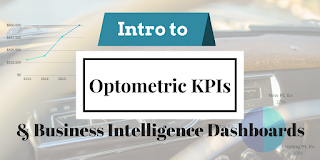 How do you know what’s important?I discovered optometric metrics, analytics, and KPIs from the Management and Business Academy’sKey Metrics of Optometric Practice in 2009. At the time, it was sponsored by Ciba Vision and Essilor and endorsed by the American Optometric Association.